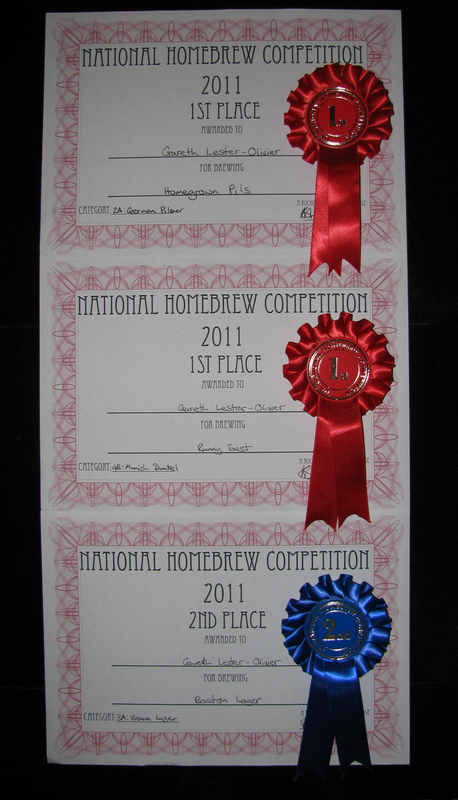 I was fortunate enough to take first place in both lager categories, and indeed second place in Dark Lager too. My first in Light Lager was a pilsner I brewed with homegrown Saaz hops, so I am hugely pleased about that. I did enter a few ales too and I did OK with a couple of mid-30 pointers, but competition was extremely stiff in the ale categories! I actually travelled up to Bristol in person for the competition and while it certainly wasn’t a festival in the traditional sense, it was clear that a lot of effort had gone into the organisation. The judge’s feedback was in depth and as such, actually quite useful. Tom Dobson went home with the Best of Show award for his Vanilla Milk Stout and I noticed some familiar names in the results (cough cough Graeme Coates, pdtnc). I’d also like to extend a very well done to Steve Wright for his “Duville” Belgian ale with Brettanomyces and a very special thanks must go out to Dr Ali Kocho-Williams for all his selfless work in ensuring that there actually was a national competition at all this year!